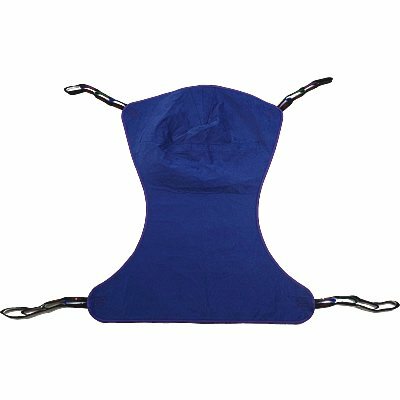 The Invacare Full Body Solid Fabric Sling is the sling you will use comfortably without any worry of it tearing or coming apart. You will be at peace knowing that your comfort and safety are what was focused on when creating this sling. Apart from that, it has the most fantastic features that you will love keep reading to find out what they are. The sling has a four-point hook- up that makes it easy for you to hook it up. It is easy to keep clean since it is made of washable fabric. The sling can be used comfortably in both wet and dry environments; this is made possible by the polyester fabric it is made of. A brushed lining enables you to stay safe, it inhibits sliding and also protects your skin from injury. It can be put in a reclining position and comfortably used by amputees. This sling can also be used by users with limited head control and those that are partially or totally dependent too. The Sling is well made; the firm stitching enhances its reinforcement giving it durability. It is strong and sturdy but has a soft finish for the patient’s comfort. You can comfortably have the sling on even when seated in your wheelchair; you don’t have to go through the inconvenience of taking it off every time you want to sit in your wheelchair. The sling is big, but that is because of the four hook points that make it super easy for you to hook it up. Sportaid offers you this comfortable and long lasting sling. It is easy to position and gives you superior support. And in case you are wondering how deep you need to dig into your pockets to buy this sling then you need to check out the amazing price that Sportaid has for it. In addition to that, experience the highest level of customer care, thanks to the friendly and helpful well informed Sportaid customer support team.